AMOLED, OLED, EL, SAMOLED, YOUM, POLED: whatever abbreviation one chooses to give organic display technology, they all describe the same basic results: deep inky blacks, vibrant colors, and near infinite contrast. Samsung has made a name for its Galaxy S and Galaxy Note series in part, because of the Super AMOLED panels the devices make use of. Even LG has gotten into the game with its G Flex series, and smartwatches. Now however, it seems that both companies are going to be working hard to put out panels for…Apple. According to a new report published today by Korean site etNews, the contracts have been finalized and are simply awaiting signatures to officiate. The possibly pending production won’t come cheap however, and will apparently require Samsung and LG to invest a total of $12.8 billion over the next 2 or 3 years, some of which Apple itself may help finance. Because flexible OLEDs that are produced from Gen 4.5 (E3) Line in Paju do not have any experience in 6th Generation, LG Display is planning to start small and gradually expand its size. From 1 sheet of Gen. 6 glass substrate, 288 5-inch cellphone panels can be produced. If LG Display increases production capability up to 60,000 sheets in the future, it will be able to mass-produce 200 million 5-inch OLED panels per year. On the other side of the competitive aisle, Samsung is quoted at receiving 30% more allocation than LG Display because of its current production facilities that already allow for high yields. Specifically, Samsung is quoted with a figure of around 90,000 sheets each month, for a 2 or 3 year period. Negotiation between Samsung and Apple is not going too smoothly. It is heard that both businesses’ stances are considerably tense on unit cost of products, technical cooperation, advance investments, and others. Because unit cost that Apple is requesting is excessively low while level of technical cooperation is high, there can be a chance where somehow Samsung’s major know-hows can flow into Apple. Samsung Display was able to collect considerable amount of operating profit as it was supplying Smartphone OLEDs to China. Smartphone OLED is a major profitable product that has higher profit rate than LCD. However as Apple is requesting one-digit percent margin, negotiation is not progressing too smoothly. Other problems listed include Apple’s well-publicized “hands on” approach to product development, something that Samsung is allegedly concerned with as it may ultimately allow competitors to reap the benefits in terms of production know-how. Although Samsung Display and LG Display are planning to start supply their OLEDs to Apple starting from 2018, they can start supplying OLEDs as early as 2017…Although Apple is requesting large amount of supplies from the start, they are carefully going over size of investments for facilities because panel manufacturers can be financially burdened since there will be more supplies than demands in the future. 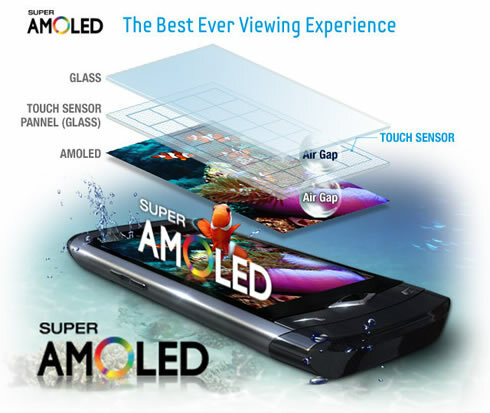 AMOLED is also a potentially big source of money for both Samsung and LG, two companies that have fallen on harder times given the intense, keen competition from smartphone and tablet manufacturers in China and India. Both companies have seen their market share erode over the past two years, and both have taken more dramatic steps to try and find a profitable picture beyond end-user product sales. LG recently reorganized itself to allow its display division greater speed and agility. Samsung’s CEO even went all out and basically warned of a path to ruin less the company makes major changes now. In addition to this, on another tangent, a rumor has broken out suggesting neither company will make the jump to 4K displays in their 2016 flagships and Samsung in particular, allegedly opting to release a Galaxy S7 that has very little visual differences going on compares with this year’s model. Meanwhile, AMOLED was recently reported with having its most profitable quarter yet, and Samsung taking a lion’s share of the profits, with 95.8% of the market. HTC has used an AMOLED panel in its One A9, OnePlus uses them for the X one, Apple uses them in the Apple Watch units, LG uses them in its LG G Watch R and Urbane series as well as the – possibly discontinued – G Flex series. Even Samsung has made it a proper priority to place these panels in plenty of its non pinnacle of premium products. Despite the claims of OLED panels offering superior battery life thanks to individual pixel backlighting and thus blacks require none whatsoever, the results are oddly polarizing. While some absolutely love AMOLED and refuse to buy anything that’s not making use of it, others have a decidedly different perspective, calling it oversaturated, cartoonish, or undesirable. 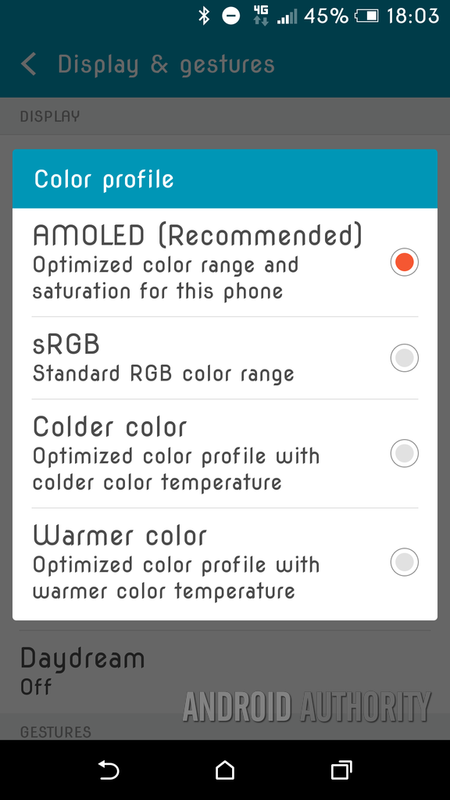 HTC One A9 (unlocked, international) has a Color profile setting with four different options. While Samsung has featured “Screen Mode” settings for years now, even HTC and Google have gotten in on the action. Perhaps dye to the requirements of finding the correct menu selection setting however, most users still seem to be unaware the “hyper” realistic color schemes can be reduced. In a recent poll on Google Plus, Android Authority community users were asked which they preferred, AMOLED or LCD. As of the time of publishing, 1,341 users had participated and the results were split with 86% favoring the former, and just 14% liking the latter. It is almost a given that Apple users will take to AMOLED should this news pan out, especially considering that many already cite the use of laminated glass as giving the devices fantastic color reproduction as is due to the lack of air between the glass and display. By the time Apple finally does manage to implement AMOLED displays into its iPhones – many state it wouldn’t happen until at least 2017 – Android OEMs may very well be widely using the panels. Currently Samsung, LG, OnePlus, Huawei, HTC, and Motorola have released products in the past year that make use of them, and potentially more in the year to come. In the event OEMs aren’t using AMOLED by the time Apple does, it is highly possible they may switch over due to the general public’s inevitable “wake up call” to the technology. An increase in AMOLED use may in turn have other effects on Google’s mobile OS. For example it would be conceivable that Google could formally introduce Night Mode to capitalize on the technology’s use of black colors to save power. Likewise, it might follow that “Active Notification” options become more standard for Android. Increased competition in the AMOLED market might also ultimately spur Samsung and LG to create new types of screens and further advance the progression of bendable, foldable, and wearable displays. LCD prices would possibly fall if demand shifts to AMOLED, which might increase the quality of panels seen on lower-end smartphones, devices that typically avoid things such as IPS LCD due to the extra costs involved. It is worth mentioning that Quantum Dot, Pixel Eyes, and IGZO are all competitors to AMOLED, and that – as ASUS often does – it’s also possible to include color profile adjustment settings on LCD displays as well. On the other hand, should Apple start buying large quantities of AMOLED panels in bulk, it might drive up the price for the technology considerably, a cost that might be passed onto the customer. It might also mean that OEMs go for inferior AMOLED panels to save money. It is actually worth posing the question: why did Motorola drop AMOLED from the Moto X Style (Pure Edition) when both the original Moto X and the Moto X (2014) made use of it. Could it be due to pricing/cost related issues? Notice the Moto X Force (Droid Turbo 2) makes use of an AMOLED panel, yet costs considerably more. The idea of Apple transitioning to AMOLED panels is nothing new, but the news of a possible contracted agreement to begin the process is a very big development. It is highly unlikely Apple itself would make a press release of the venture given the tendencies it has to keep non-internal component related business dealings as low key as possible. Consider that the company, to this day, still does not mention Gorilla Glass, nor does it make a point to mention the companies who supply the components for its products. The list includes Samsung, LG, Sony, Sharp, and many more, yet all the mainstream public hears about is Apple’s A9 Soc or Apple’s camera. We are eager to hear your take on this matter. Does Apple’s potentially making use of AMOLED have a collective benefit in the business, or will it make things worse? Is Apple eager to make use of the power saving features, or does it just want to “copy” Android OEMs? Would an AMOLED iPhone potentially spell trouble for LCD Android devices in terms of the mainstream consumer’s decision making process? Please leave your comments below and let us know!